The Hammer and sickle is a symbol that has been used in communism. It was developed during the Russian Revolution, but was not an official symbol until 1922. 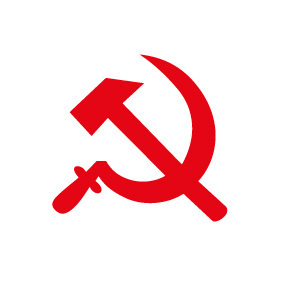 The two crossed tools, hammer and sickle, supply the idea "Unity of peasants and workers”. The hammer and sickle symbol is probably best known from its application to the red flag of the Soviet Union and the Chinese Communist Party. Then along with the star symbol. It has also been used in other contexts. The former Soviet national airline Aeroflot, still use the hammer and sickle symbol in its logo.